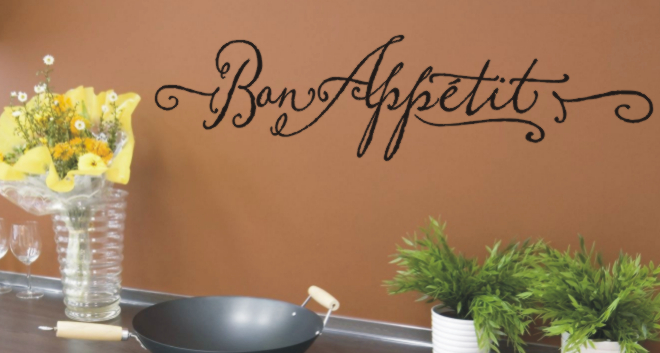 5.5" tall x 24" long Black Vinyl Wall Lettering by The Simple Stencil that reads "Bon Appetit" in a fancy script with end flourishes. This is sure to dress up a bare space in the kitchen or dining area. Easy to install vinyl wall lettering - affordable and removable! Looks Painted On! If your walls could talk... What would they say? Provide high quality wall lettering and graphics for upscale interior design for both home owners and commercial clients. Interior and Exterior Vinyl Wall Lettering - Diecut so that it goes on smooth and looks painted on. We only use the highest quality products in a matte finish which is the same exact materials used by Uppercase Living, Wall Words and other companies. Great designs or design your own in our easy to use design center. 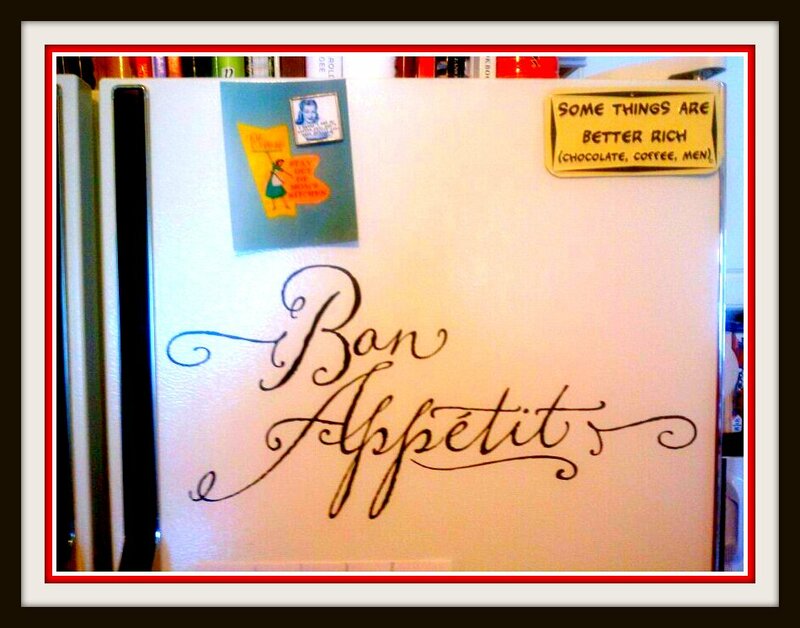 My take on the product: I was sent the Bon Appetit vinyl wall lettering to review. I was very impresses with the clear etched design of the letters. My fridge has a texture surface so I was concerned with how well the letters would take to the surface. I followed the well designed, step-by-step provided instruction and had no problem at all with the product sticking and staying on my surface. I also had a few other designs that did great, too. One was on the back door that said "Welcome" and the other, a butterfly that went on my 12 year old daughter's wall which she applied herself. Check out how easy it is to add the lettering to your surface, here. These vinyl wall letters go on quick and easy! Such an inexpensive way of fixing up an area that needs a little sprucing! SPECIAL OFFER: All my readers can get 15% off their entire order with promo code FACEBOOK15 if they go LIKE Simple Stencils on Facebook. Please go check out The Simple Stencil and see all of their designs. Do you see any that you would like? Leave a comment to be entered to win! Include your email address so you can be contacted if you win. 7) Comment on any of my non giveaway post for up to 5 bonus entries. I'd get "what little girls are made of" for my daughters room. I follow you on twitter as nicolthepickle. I like the stencil that reads: Having someone to love is Family, Having somewhere to go is Home, Having both is a Blessing. I am following your blog on facebook. I am a fan of Simple Stencil on facebook. I love this stencil also. And this one just about says it all. I love the "Happiness is Homemade" quote! I like the live laugh love, I am a follower. Thanks for hosting the review and giveaway...I love how your results turned out on the refrigerator! Thank you too to all your readers who entered the giveaway and please let them know that they can save 20% off thier entire order during the month of April using coupon code SPRING11 and we are offering a freebie through April 18th with every order. More details on our homepage. Thanks again! I really loved your blog and also following on Facebook. I wanted to thank you for this excellent read!! I definitely loved every little bit of it.Cheers for the info!!!! & This is the perfect blog for anyone who wants to know about this topic. You know so much its almost hard to argue with you.